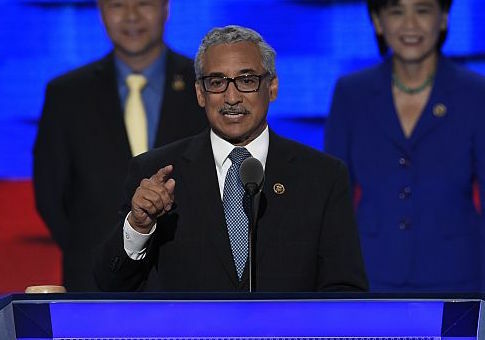 Rep. Bobby Scott (D., Va.) was made aware of the sexual assault allegation against now-Lt. Gov. Justin Fairfax (D., Va.) in 2017, more than a year before the accuser went public. Vanessa Tyson, who released her official statement detailing the alleged 2004 sexual assault on Wednesday, told Scott in October 2017 she was "not a fan" of then-candidate Fairfax. She would later contact Scott in late-November through email, where she expressed her dislike for Fairfax and told Scott she wanted to talk about it, according to ABC News. In a text message exchange between Scott and Tyson in December 2017, she informed him that the now-Lieutenant Governor-Elect had a "MeToo allegation," but at the time the congressman did not know that she was the accuser, according to aides. In late December 2017 and early January 2018, aides to Scott said he learned that it was Tyson herself who was involved in a "MeToo allegation," concerning Fairfax. She also informed him that she had already told the Washington Post about an alleged incident involving Fairfax and that she had given the Post Congressman Scott's name as a character witness. Scott told ABC News that the allegation must be properly investigated. "Allegations of sexual assault need to be taken seriously," Scott said in a statement. "I have known Professor Tyson for approximately a decade and she is a friend. She deserves the opportunity to have her story heard." Scott's aides maintain Tyson never discussed with the congressman her experience involving Fairfax in the previous years they were friends, prior to the time period between December 2017 and January 2018. Fairfax has denied he sexually assaulted Tyson in his hotel room at the 2004 Democratic National Convention, while he was serving as a personal aide to then-Sen. John Edwards (D., N.C.). ABC News obtained a statement from Tyson's friend, who did not want to be identified in fear of harassment and threats. "Vanessa has always been forthright and matter of fact with me about all things and was no different in regards to this incident," the friend's statement read. "I trust her beyond measure and know how this incident haunted and traumatized her because she told me so and because I know her well and could hear the anguish in her voice. She sounded resigned, yet disgusted, frustrated, and infuriated in a way that I can sadly recognize from personal experience." Scott was accused of sexual harassment in 2017 by a former aide, who alleged he touched her inappropriately and asked her to flirt with him while she worked in his Washington, D.C. office in 2013. He strongly denied the allegation. This entry was posted in Politics and tagged Justin Fairfax, Sexual Assault, Virginia. Bookmark the permalink.